​One thing that delighted me about Sheila was her never ending quest for knowledge. Constantly and consistently curious about all things, even the one thing she was most known for, horses. I'd watch her in that big arena, completely focused on Jubilation or whichever horse she was on, making the perfect circle, keeping the perfect frame, placing each foot precisely, and so on. I'd watch her and then I'd try to do the same. It was nowhere as pretty, let me tell you. These days the horse is the one training me. I keep Sheila close in my mind while I ride, trying to re-hear her words. We have the whole summer ahead to get out there in the mountains, but for now, until the snow melts, we mainly work in the arena. This is not where I spend a lot of time, so I have a lot to work on. Posture, hand position, cadence, transitions, stretching out, collection, leg yields. The list goes on. Every horse I ride teaches me. As soon as I think I have something really figured out, I'll have a day that I feel like a real dufus. Another day will come along when I feel deflated, like I'll never be a horsewoman, and the horse will make me feel darn spectacular. 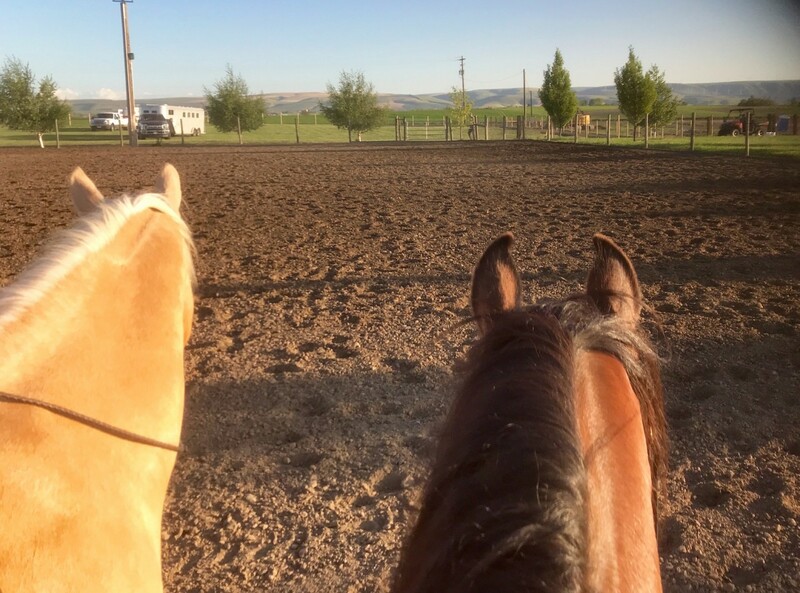 Arizona has been in the arena at Varian Arabians, with Jaime for a few months, but here we are in Walla Walla, Washington. 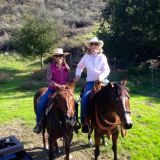 My friend Anita invited us to come to an 'open ride' at an arena in town, where people come together to ride, leg up their horses, and visit. I was pretty sure Arizona had not been in a big arena with a number of other horses and I didn't know what the other horses would be like. We arrived early, thinking that it would be easiest on him if he got comfortable in the arena first before anyone else showed up. I lunged him a little bit and got on. He was pretty relaxed, but was a little on tip toe, his little ears and dark eyes soaking it all in. We just walked. There were speakers playing music that was something new, and there was a heel-o-matic roping dummy in the corner. "What the heck is that?" he stopped, looking at the brown plastic calf. I could have shoved him past it, but he's never seen that before. We just stopped and looked. I could feel his body soften as he thought maybe it was not a predator after all, and I asked him to take a step. One step closer and he looked at it again, pretty sure it was going to bite him. I like to give the horse the respect of checking something out if he's never seen it before, and in about two minutes he was licking the back of the dummy. Then we went on. The other riders dribbled in, we all said hello as we passed each other by. Arizona's attention went to each of the other horses, wondering were they safe? We just stayed walking beside Roy and I gave him the opportunity to figure it all out. When he seemed relaxed about everyone there, I asked for a little trot, then slowed to a walk. Slowly we separated from Roy, then returned. I just asked for little bits and then we'd go back to his comfort zone. The energy in the arena rose as the horses warmed up and soon most everyone was loping nice big circles or around the edges. One horse got a little humpy, bucking across the arena. Arizona watched, wide eyed. (the young girl stayed on, bravo). The biggest problem he had, was when I took him far away from Roy, with the other horses loping around. We just worked it out quietly and eventually we were able to stand at one end of the arena, horses loping/trotting by close in front and behind, looking at Roy standing at the other end. I could almost hear the wheels in his head turning but his feet stayed still. That was enough for me. A couple nights later, we went to the arena at the Fairgrounds, just the two of us (or four of us if you count people and horses). This was a no brainer, he was completely content and not at all distracted, not at all worried about where was Roy, so instead of working on his mind, I got to work on my skills, which are quite a vast distance from what he's used to, Jaime. Like patting my head and rubbing my belly, I worked on my body. As long as he kept the gait I asked for, I worked on keeping my spine straight, shoulders relaxed and back, hands low, I worked my legs and seat. He rewarded me promptly when I did it right. He let me know what we need to work on some more. I could do this every day. It's a tall mountain to climb, this horsemanship stuff, and I'm pretty sure we never reach the top. Well, very few do at least, but I'm on my way.